When Sony announced the launch of its NEX compact system camera range, it was quick to draw on its heritage by launching the LA-EA1 adapter (see left, top) to connect its A-mount and Minolta lenses to the new E-mount NEX cameras. While third-party adapters can be bought for as little as £20, this £180 adapter has an aperture mechanism and electronic contacts to support auto exposure, and also enables the use of AF where possible. 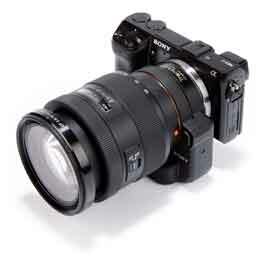 A second adapter, the LA-EA2 (see left, bottom), followed when Sony announced its NEX-7 camera. This adapter offers all the benefits of the first unit, but also includes a phase-detection AF module and translucent mirror technology (pellicle mirror) set-up, as found in the firm’s latest Alpha cameras, such as the Alpha 77. Both adapters are compatible with all NEX cameras. When compared to a fully manual adapter, both Sony adapters are much more useful thanks to the included electronics. Auto exposure, including control over shutter speed and aperture, can be selected in-camera as if the lens were directly mounted to the camera. The real benefit, however, is that AF is possible. To use AF with the LA-EA1 adapter, a lens with a built-in AF motor is required. In Alpha lenses this is indicated by the SAM or SSM suffixes. 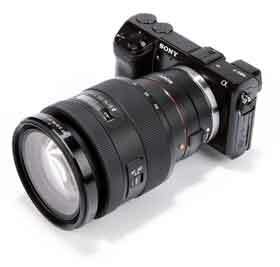 It may also be necessary to perform a firmware upgrade for the camera and adapter before AF will work. Once in use, however, AF via the LA-EA1 adapter is not as rapid or even as successful as one might hope, with the adapter’s focus hunting back and forth for a subject. The hit rate is increased by selecting spot AF rather than multi-segment AF. 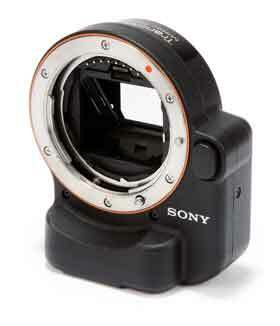 Overall, though, those who are used to the AF speed on their Sony NEX camera will be frustrated. I found myself opting for manual focus more often than I would like. The same cannot be said for the LA-EA2 adapter. With this adapter attached, AF speed is dramatically improved. In fact, there is little difference in speed between an E-mount lens mounted directly on the camera and an A-mount lens attached via the adapter. 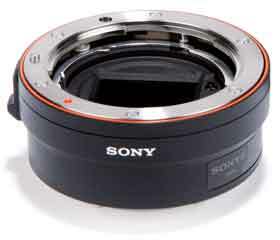 The adapter is actually often quicker, making the most of the technology used in the Sony Alpha models. The LA-EA2 adapter is bulky and one of the most expensive around, but for those who already own Konica Minolta and Sony Alpha glass, it could mean a huge saving over buying new E-mount lenses. Furthermore, the selection of A-mount and Minolta lenses is much greater than that which is currently available for the E mount.